Apple Cider Vinegar is a completely natural product, resulting from the fermentation of apple juice to hard apple cider followed by a second fermentation to apple cider vinegar. It retains all the nutritional goodness of the apples from which it was made plus it is fortified with the extra acids, probiotics and enzymes produced during the two fermentation steps. 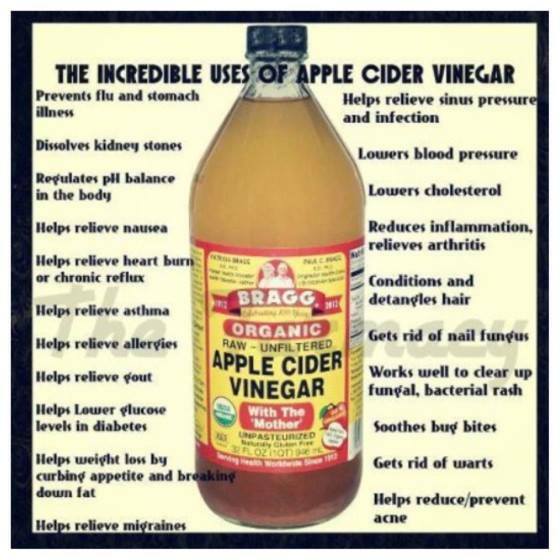 The vinegar is also rich in fiber and potassium. This entry was posted on April 28, 2015 by thrivecoach12 in Super Foods and tagged anti-cancer agents, Anti-Inflammatory, appetite suppressant, apple cider vinegar, digestive aid, fermented apple juice and apple cider, food high in fiber, healthy immune system, reduces cholesterol.